PIECH1The endangered Swift Parrot Lathamus discolor breeds mostly in coastal south-eastern Tasmania, an area whereurban development is common and the city of Hobart is situated. Hobart’s suburbs are visited regularly by foragingSwift Parrots that nest in the surrounding forests. The reproductive success of Swift Parrots depends largely on theavailability of the birds’ major dietary items, the nectar and pollen of Eucalyptustrees. This study investigated therelative value of suburban trees and those in adjacent native forest in Hobart as food sources for Swift Parrots. 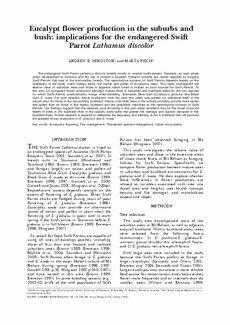 Tothis end, we compared flower production between mature trees in suburban and bushland areas for the two specieson which Swift Parrots predominantly forage while breeding; Tasmanian Blue Gum Eucalyptus globulus and BlackGumE. ovata. For both species, flower production over the past few years was greater for individual trees in thesuburb than for those in the surrounding bushland. Hence, individual trees in the suburb probably provide more nectarand pollen than do those in the nearby bushland and are potentially important to the reproductive success of SwiftParrots. Our findings suggest that the relatively poor flowering in this peri-urban bushland may be the result of poorerhealth of trees in the bushland than in the suburb, particularly the greater fire damage and sparser canopies in thebushland trees. Further research is required to determine the frequency and intensity of fire in bushland that will promotethe greatest flower production in E. globulus andE. ovata.